Mississauga is located in Southern Ontario in the municipality of Peel in the western part of the greater Toronto region. Area renters can easily enjoy the City Square which has sports and gaming facilities, including basketball, a hockey arena, and a skate park. Area residents can stop by and borrow a good book from the Central Library, spend time at the Playdium, a high-tech, interactive, entertainment center, or go shopping at one of Canada’s largest malls, Square One Shopping Centre. Mississauga is the fourth largest city on the Great Lakes, surpassing both Milwaukee and Cleveland over the last decade. Seven major highways run through the city, offering convenient access to Canada as well as the United States. Toronto Pearson International Airport is located in the city making the area globally accessible. Mississauga apartments for rent are available in a wide variety of diverse neighborhoods and surrounding areas. An expansive suburb, Mississauga has a distinctive image and is appealing to businesses and residents alike. Mississauga is home to major international companies making it a great place to rent. In the immediate region companies include Fujitsu, General Electric, Heidelberger Druckmaschinen, Hewlett-Packard, Microsoft, and Wal-Mart Canada, offering thousands of employment opportunities. 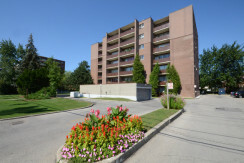 Finding apartments rentals in Mississauga, is not difficult if you know where to start. Cando Apartments will help you narrow your search to amenities that are a must for your lifestyle, and ensure that all Mississauga apartment rentals referred by your search meet your specific requirements. Cando Apartments is dedicated to quality service. We offer a variety of buildings with a choice of amenities and price ranges, making it easy for you to find a rental apartment that suits your individual preferences. All buildings are clean, offer up-to-date amenities, are staffed by professional superintendents and assistants, and backed by top-notch property management staff. Cando’s Mississauga apartments offer highly competitive rents while maintaining high standard of living for its residents.